In recent years, China has vigorously promoted natural gas to replace energy sources such as coal-fired fuel, and natural gas consumption has continued to grow rapidly. In 2017, China's natural gas consumption was 237.3 billion square meters, up 15.3% year-on-year; natural gas production was 148.7 billion square meters, up 8.54% year-on-year, and natural gas import dependence was 38.4%. The development of industrial automation continues to demand more energy. Natural gas is used as a green energy source; this kind of source is environmentally friendly and economical. The measurement of natural gas is very important. Gas flow meters are widely used in industrial production processes, energy metering, environmental protection engineering, transportation, scientific experiments, etc. At present, China's gas flowmeter products for natural gas flow measurement generally include: gas roots flowmeter, gas turbine flowmeter, spiral vortex flowmeter, vortex flowmeter, ultrasonic flowmeter and orifice flowmeter, etc. 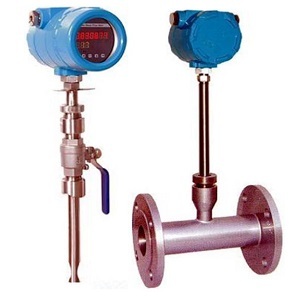 The flow measurement of natural gas is divided into volume flow measurement and mass flow measurement. Today we mainly introduce the application of thermal gas mass flow meters in natural metering. The main component of natural gas is methane, which contains alkanes with relatively high molecular weight (mainly ethane. Natural gas is a explosive and flammable mixture, and some natural gas contains toxic sulfides, so the safety measurement requirements are high. Natural gas is measured in the United States using normal cubic meters (corresponding to 101.325 kPa, zero degrees Celsius) standard cubic feet (corresponding to 14.73 psia, 60 degrees Fahrenheit) commercial natural gas with a combustion calorific value of about 10.8 kWh per normal cubic Meter or 1000 BTU per standard cubic foot. A change in its gas composition causes a change in the calorific value. 1. The thermal mass gas flowmeter has the advantages of high measurement accuracy, wide measuring range, low power consumption, convenient installation, simple operation and low pressure loss. 2. The Thermal dispersion or immersible mass flow meters can directly measure the mass flow without the compensation of temperature and pressure. It is unlike traditional orifice plate gas flow meters or vortex flow meters, they need external temperature and pressure compensation. The external temperature and pressure compensation is realized by flow sensor, RTD temperature sensor, pressure transmitters and flow computers. 3. Before choosing the right gas sensor, we need to know the composition and content of the precise gas. 4. Gas flow meters need to maintain long-term measurement accuracy, requiring regular maintenance and calibration. 6. The Thermal dispersion gas flow meter can measure low flow rate and low flow gas, and the flow meter sensor also has high sensitivity signal. 7. Thermal mass flow meters can have RS485 Modbus RTU, Hart Communication; it is standard with 4-20mA output, meet customers process control purpose. SILVER AUTOMATION INSTRUMENTS supply China thermal mass flow meters with good price and reliable quality. if you want to know the price cost of natural gas flow sensors, feel free to send email to us to obtain the price and technical catalogs.